Your digital health practice management software is accessible anywhere, anytime and saves you time, money & effort. coreplus is secure and supports your Privacy Act compliance with no hidden fees, no contracts and super responsive customer service. Our "book-now" button integrates seamlessly with your website or Facebook page so that your clients can access your availability 24/7. 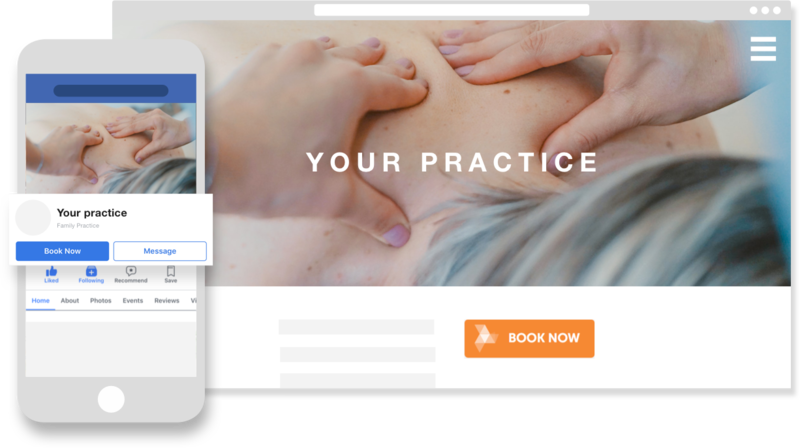 No third parties involved, no ads, just direct access by your client to your practices available appointments with bookings supported by automatic reminders. Our integrated Medicare/ DVA claiming can be used anywhere, anytime without a terminal or merchant facility. You'll have less paperwork, effortless reconciliation, faster payments, streamlined billing and convenience for your clients with on the spot or split payments. Constant access to your practice anywhere, anytime. Client’s know when your practice is running smoothly & efficiently. Take advantage of cloud-based technology to empower your daily workflow and improve client outcomes with smarter online software. Use our powerful calendar to view practice appointments for any time period. Easy to use, yet powerful customisation supports categorisation, appointment types, searchability, scheduling, reminders, reporting, multiple practitioners/ rooms/ locations. Have centralised control, management and comprehensive reporting allowing review of individual practice performance such as appointments, patients, referrers, productivity, internal activities, Medicare & DVA claims, financial and more. With coreplus’s integrated cash flow optimisation technology as your billing and payment solution, cash flows to your account faster and easier, letting you focus on practicing happy! Medicare cash flows faster with coreplus’s integrated online claiming technology. No terminal fee, no brokerage fee. Our Medicare claiming integration offers real time approvals available anywhere, anytime and included free when you subscribe to coreplus. coreplus is constantly working on improving cash flow management for our community of users and continues to develop integration that support 100% web based health billing & claiming. coreplus is building a community of certified third party add-on partners to allow you to grow your practice any way that you decide is best. 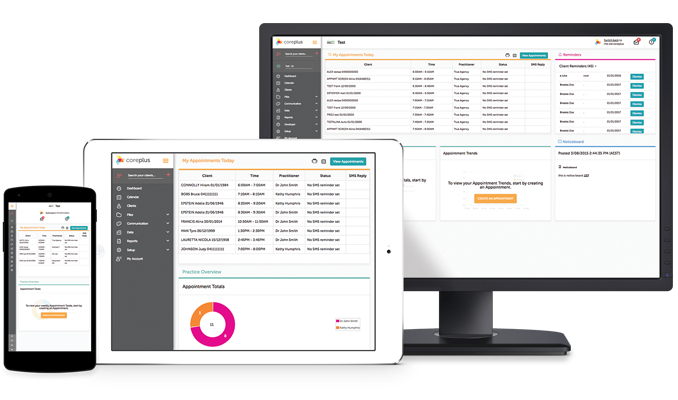 coreplus is easily integrated with billing, claims and payments which saves you on merchant, transaction and terminal fees. coreplus gives you access to a free secure booking platform so that you can offer configurable 24/7 online booking for your clients. Our eHealth plan offers a unique method supporting CDA eReferrals or HL7 messages allowing you to receive from and reply to other health practitioners using secure messaging in accordance with inter-operability standards in Australia and the Privacy Act. Our secure message delivery hub is connected to Telstra Health (Argus) and Health-link offering you access to the largest network of connected GP, Hospital & Specialist e-Referrers. Once set up, you'll be listed on secure message directories across the majority of systems accessed by GP's, Hospitals and Specialists. You'll be Digital health ready, easier to find and easier to communicate with where sensitive and private client healthcare information is concerned. Easily create, edit, copy or reschedule a appointments for multiple practitioners. With colour coded appointments, appointment limits, waiting lists, iCal sync and much more. Create invoices and take payment straight from a clients appointment for quick & easy billing. Use our third party billing to invoice insurers and employers. Understand your weekly appointment totals and trends. Compare Billable, Cancelled and No show appointments to last years to see improvements in your practice. All your treatment and clinical notes can be easily stored online with drafting functionality. Create and use templates to complete case notes or enter diagnosis summaries with body charting tools. Easily create simple and professional letters in coreplus with templates. Change fonts, edit letter margins and even add merge fields to insert details automatically in your letter. Extend patient & practice management in a way that suits your needs. Grow your practice any way that you decide is best by integrating with our add-on community.